Last week, Dynamite Entertainment partnered with Humble Bundle for one of the most jam-packed collections of comics and prose yet! This week, that jam-packed bundle gets even more crowded with the addition of more amazing books! 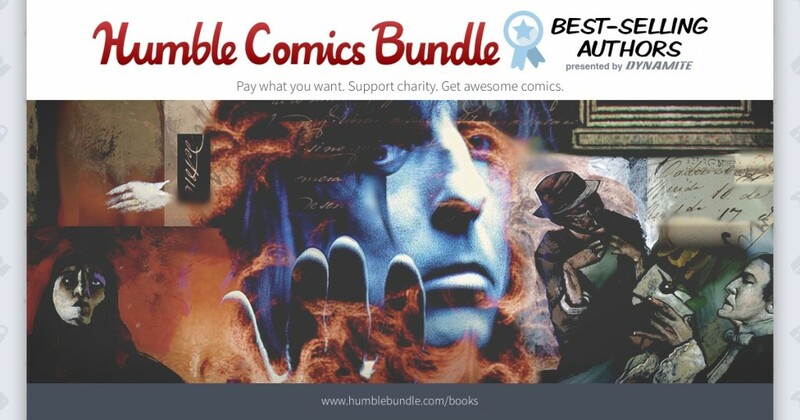 This bundle features some of the biggest authors in Dynamite’s catalog, giving readers nearly $300 in content for a fraction of the cover price for fans to pay what YOU want for each bundle, and introduce yourself to Dynamite’s library of literary titles! Dynamite was founded in 2004 and is home to several best-selling comic book titles and properties, including The Boys, The Shadow, Red Sonja, Warlord of Mars, Bionic Man, A Game of Thrones, and more. Dynamite owns and controls an extensive library with over 3,000 characters (which includes the Harris Comics and Chaos Comics properties), such as Vampirella, Pantha, Evil Ernie, Smiley the Psychotic Button, Chastity, and Peter Cannon: Thunderbolt. In addition to their critically-acclaimed titles and bestselling comics, Dynamite works with some of the most high profile creators in comics and entertainment, including Kevin Smith, Alex Ross, Neil Gaiman, Andy Diggle, John Cassaday, Garth Ennis, Jae Lee, Marc Guggenheim, Mike Carey, Jim Krueger, Greg Pak, Brett Matthews, Matt Wagner, Gail Simone, Steve Niles, James Robinson, and a host of up-and-coming new talent. Dynamite is consistently ranked in the upper tiers of comic book publishers and several of their titles – including Alex Ross and Jim Krueger’s Project Superpowers - have debuted in the Top Ten lists produced by Diamond Comics Distributors. In 2005, Diamond awarded the company a GEM award for Best New Publisher and another GEM in 2006 for Comics Publisher of the Year (under 5%) and again in 2011. The company has also been nominated for and won several industry awards, including the prestigious Harvey and Eisner Awards.